The legitimate industries with a long history in Christchurch include boat building, manufacture of clothing, fusee chain manufacture, aircraft manufacture and military engineering. Unfortunately, not everyone prospered from the town’s industries and so the need for the care of the poor also had to be addressed. 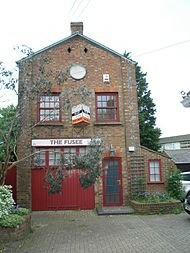 However, the workhouses provided good child labour particularly for fusee chain making. Like many parishes, as a way to reduce the cost to ratepayers of providing poor relief, Christchurch established a workhouse during the 18th century. The original workhouse was built in Quay Road in 1763 – 1764. By 1777 it was recorded as being able to accommodate up to 150 inmates. 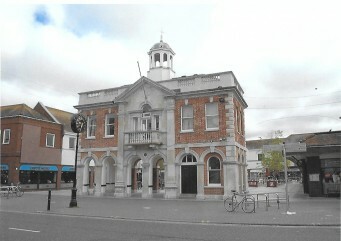 Christchurch Poor Law Union was formed on 28th July 1835 with its operation overseen by an elected Board of Guardians. The main building which fronted onto the roadside had the dining hall , with the Guardians’ Board Room at its centre. 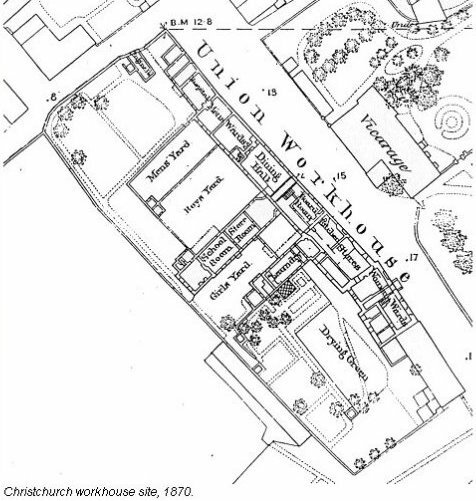 Men’s accommodation lay at the north side and women’s at the south, with the school room and children’s quarters in the rear central wing. By the late 1860s, the conditions in the workhouse were poor. 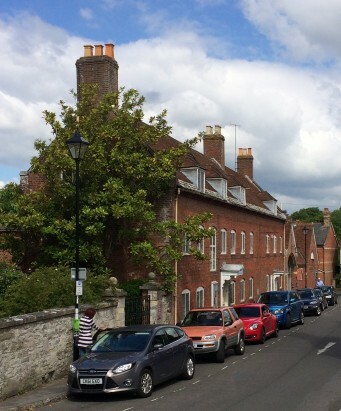 Owing to an increasing population in the Christchurch area there were calls for a new and larger workhouse. 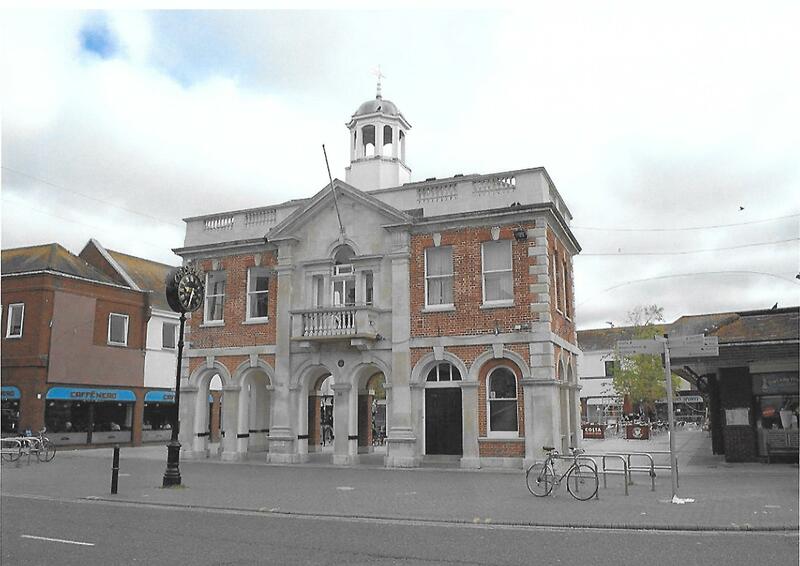 In 1877, plans were prepared for a new establishment on the Fairmile Road. The property in Quay Road was purchased by the Druitt family of wealthy solicitors with a keen interest in history who turned the old workhouse into a museum which was bequeathed with its contents, to the town and opened in 1951 as The Red House Museum. The Fairmile Road workhouse was erected in 1881 with the intention of housing 200 inmates. 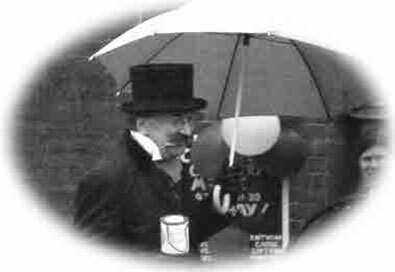 The new building was opened on 23rd August 1881. The workhouse had an entrance block at the south along Jumpers Road. This featured a central archway with a porters’ lodge and vagrants’ wards to the west, and the board-room and married inmates’ quarters to the east. The main building was a pavilion-style layout with a central block containing the Master and Matron’s accommodation, with the dining-hall and kitchen behind, and a workshop block running east-west at its rear. A women’s block, linked by a connecting corridor, lay to the west, with a corresponding men’s block lay to the east. An infirmary block was added in 1882 at the rear of the workshops. A children’s home and school were added at the west of the main buildings in 1886. An additional men’s pavilion was added to the east of the existing block in 1895. A large new infirmary complex was added at the north of the site in 1913. The site is now the Christchurch National Health Service Hospital. 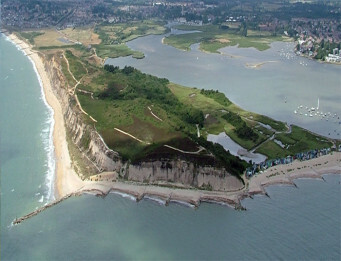 In 1847 a successful businessman, George Holloway, having already established himself as a boat builder on Mudeford Spit and coal-merchant, applied for a lease from the Lord of the Manor (who claimed foreshore rights) and permission to dredge ironstone from the sea as well creating an open-cast ironstone mine at the foot of Hengistbury Head. 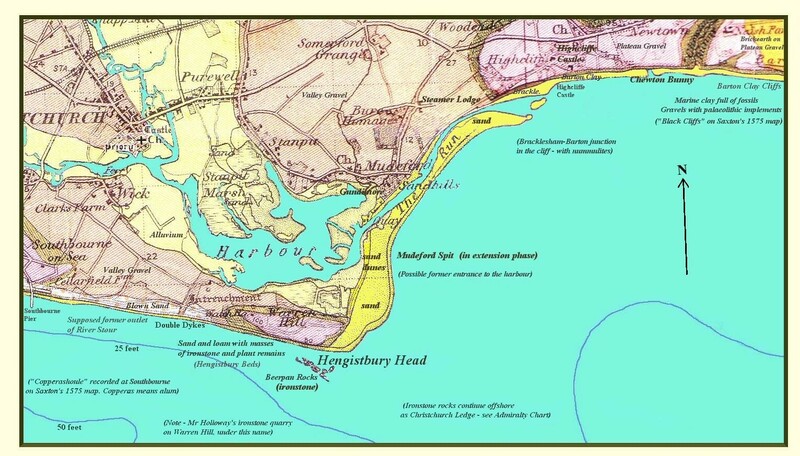 Holloway owned a small fleet of merchant sailing ships engaged in bringing coal from South Wales and Southampton to the Christchurch Town Quay but required ballast for the return journey so saw that there was a good profit to be made from shipping the ironstone. The iron content of about 30% made it profitable. 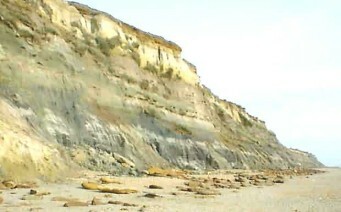 By 1852 he began digging into the base of the cliffs. Between 1856 and 1864, 52,650 tons of ironstone were removed. As the damage George Holloway was doing to the Head and the coastline resulting from the removal of a natural breakwater became apparent local opposition grew. By the time Holloway was stopped in 1867, a third of the Head had been removed or lost through increased erosion and his mine had almost cut through to the sea beyond. In 1938 a long groyne was built to reduce the erosion but the damage had been done. 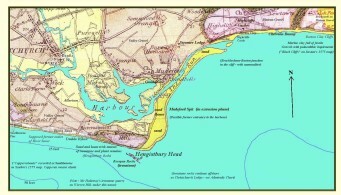 In contrast the Mudeford Beach Spit extended considerably in the period between Holloway’s first ironstone removal and the building of the long groyne, from the Black House to Steamer Point – a distance of over a mile – confining the entrance to Christchurch Harbour to a narrow Channel, The Run, between the spit and Avon Beach. The problems of the Mudeford Beach Spit still exist in 2016 despite Christchurch Borough Council’s unsuccessful attempt to maintain a navigable channel to Christchurch Harbour. In 1790, Robert Cox started manufacturing fusee chains for use in the gearing mechanism of watches. The work was extremely intricate as the chains were only fourteen-hundredths of an inch thick, therefore children as young as nine, from the local workhouse, were employed in their manufacture and paid 1s 6d for a seventy hour week and from 1802 were being taught to read for ten minutes each morning and afternoon. By 1793 Robert had a monopoly on chain production in Britain, supplying watch, clock and chronometer makers throughout the country. Production flourished and in 1845 William Hart opened a similar factory built to an advanced design with particularly large windows on either side, seventy-four feet long but only eighteen feet wide to allow the maximum amount of natural light to enter. Hart’s Factory was the start of a new deal for the chain makers of Christchurch, although the pay remained low. the girls from the age of 12 had the opportunity to either work at home as a cottage industry or work in the factory. This factory is visited on the Bargate Virtual Historic Walk. Eventually there were three fusee chain factories in the town. The factories also led to a local clock industry and a gun industry for pistols and shotguns. By 1875, because of changes in watch design, the chains were no longer required, and the factories were closed.